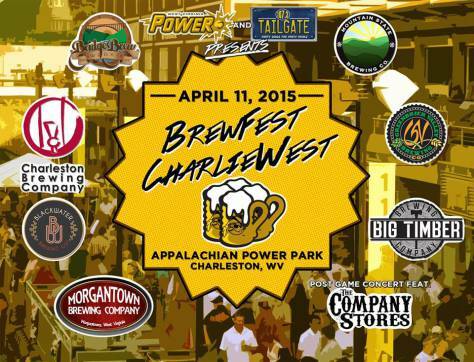 Posted on April 20, 2015 by Amanda W.
Blackwater Brewing Co was one of seven West Virginia breweries at the Inaugural BrewFest CharlieWest held Saturday, April 11, at the Appalachian Power Park in Charleston, WV. The festival was a promotion of the baseball team as part of its season-opening home stand. It was a spectacular day with a better than expected turn out of craft beer enthusiasts. In fact, the only hitch was that there wasn’t enough beer. Blackwater Brewing Co brought two German style brews – Canaan Valley Kolsch and 3200 Alt Bier. Both were well received, and quickly tapped out!